I do apologise, readers, because this post is late. Here in Tokyo we've already come to the end of the sakura (桜 "cherry blossom") season. 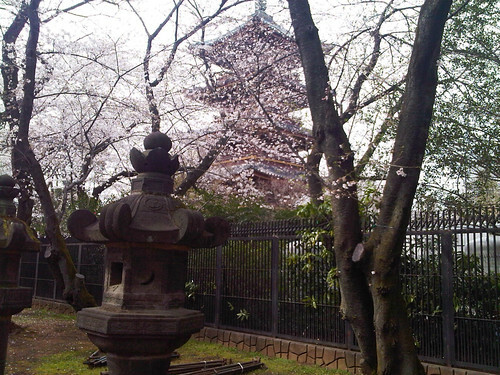 In Tokyo, sakura start to bloom around mid-to-late March and reach their peak about 7 to 10 days later. The season starts earlier or later in the year depending on the region. It's important to note, also, that there are many different varieties of sakura, and they do not all start to bloom at exactly the same time. Once the flowers start to bloom, it is only about two to two-and-a-half weeks later that the blossoms begin to fall and the leaves start growing. Strong spring winds or rains have the potential to shorten the blooming cycle considerably. The time to enjoy them is short and fleeting, and from what I gather, this seems to be part of the appeal. 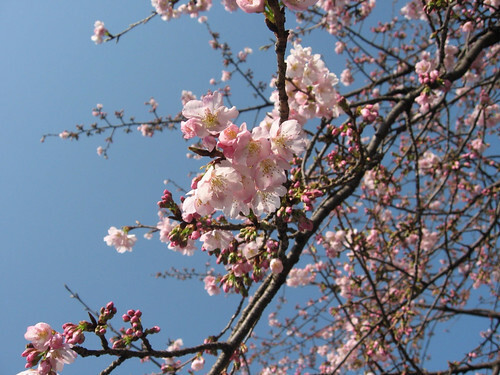 Once the first cherry blossoms of the spring start blooming, a sakura blooming forecast becomes part of the daily weather report, so that everyone can plan for the arrival of the "Sakura front" in their area, and make the most of it. 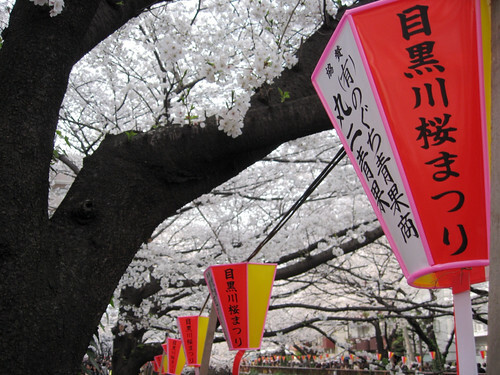 During the time when the trees are blooming, people gather any place where there are high concentrations of cherry blossom trees and enjoy Hanami (花見). 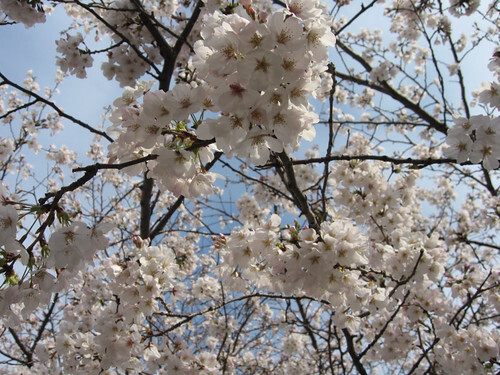 The word hanami literally means flower viewing, but when this word is used it's understood that the flowers being viewed are sakura. It is said that the first use of this word in reference to cherry blossom viewing occurred in the famous Heian period (平安時代 794 - 1185) novel, The Tale of Genji (源氏物語) by Murasaki Shikibu (紫式部). It's well known that Japan is famous for sakura and since this year was my first time to actually see the trees blooming with my own eyes, I wanted to be sure and really enjoy it. 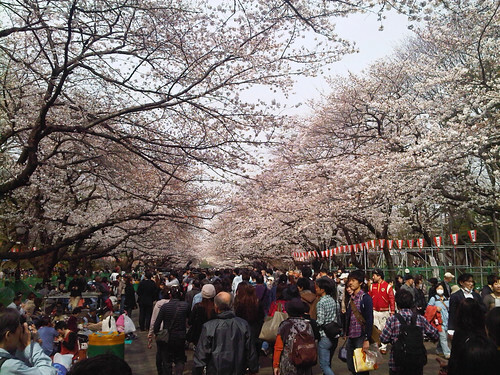 Right at the start of the season, my wife and I went to historic Ueno Park (上野恩賜公園) which has been one of Tokyo's favourite hanami spots for hundreds of years. We mostly saw flower buds and blossoms just starting to open, but there was a small handful of trees that already looked incredible. 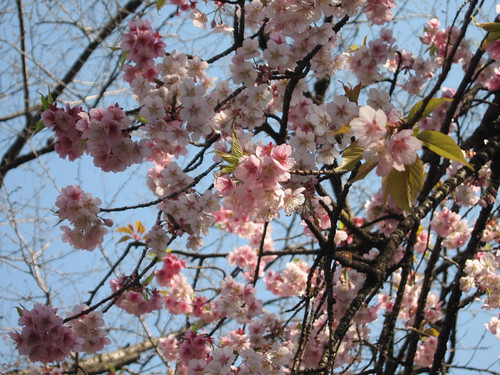 These were yaezakura (八重桜) or multi-layered cherry blossoms which start flowering a little earlier then most. 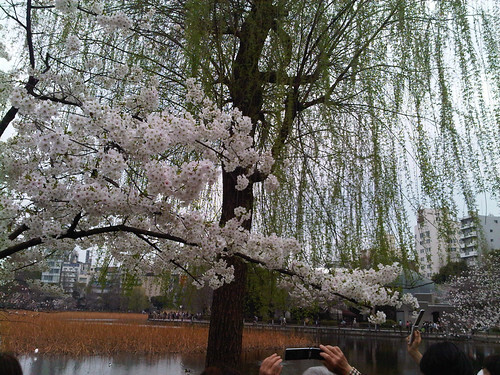 A week later when we returned to Ueno Park, the trees, both yaezakura and the more numerous somei-yoshino (ソメイヨシノ), were in near full splendor. There must be well over 100 trees lining either side of park walkways, and to say that it was breath-taking simply does not do it justice. The backdrop of Ueno Park's centuries-old history and beauty seemed to compliment the freshness and fragility of the blooming cherry blossoms. The air seemed to be tangibly filled with energy both from the blossoms themselves as well as from all of the many hanami-goers. Lots of street-food vendors come out for the occasion to cater to the many thousands of park visitors, which adds to the festive atmosphere. Groups of friends and family gather under the trees for picnics, which apparrently sometimes begins with folks arriving several hours in advance to reserve their favourite spot! Since I first started visiting Tokyo 10 years ago, Ueno Park has always been a treasured spot, but now I have even more reasons to love it. 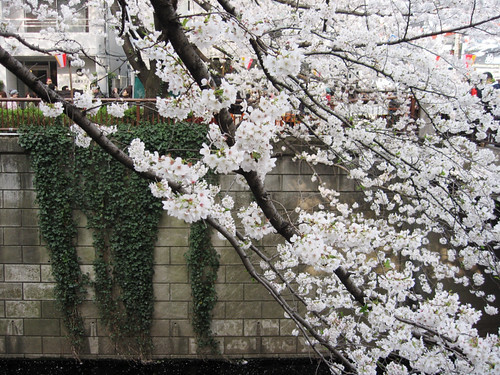 The following weekend, when the cherry blossom trees were at their peak, my wife and I were invited for hanami in our friend's neighbourhood, Meguro (目黒) which has another legendary hanami spot, Meguro River (目黒川). Here, as the name suggests, the trees grow along each side of a long river forming a canopy over it, which is clearly a recipe for some gorgeous scenery. Here as well, the trees are so numerous that views of anything else in the surrounding area are somewhat obscured. 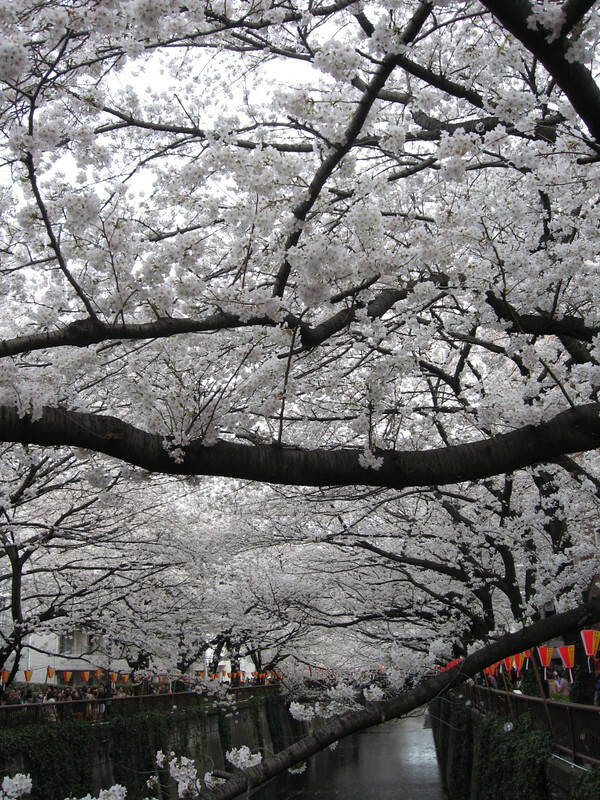 The blossoms thickly covered the branches which lended to an appearrance reminiscent of snow-covered boughs. 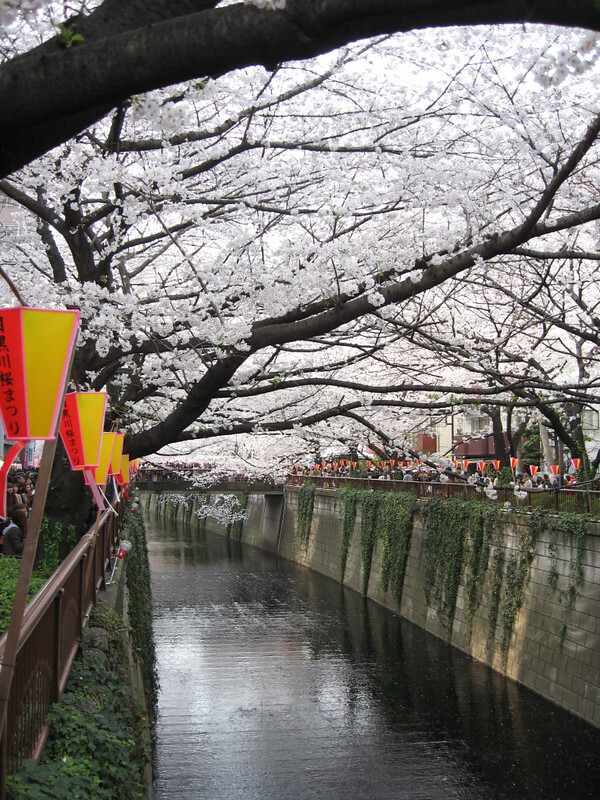 Sakura petals fell in a spring flurry, and fluttered down into the river below to be carried off downstream. Sakura-scented champage was sipped, hawaiian doughnuts were eaten (ok, that part is not so traditional, but they were delcious!!) and it was a moving experience overall. It will be another incredible experience again next year, I'm sure, now that I'm a seasoned hamami professional (haha, yeah- right). 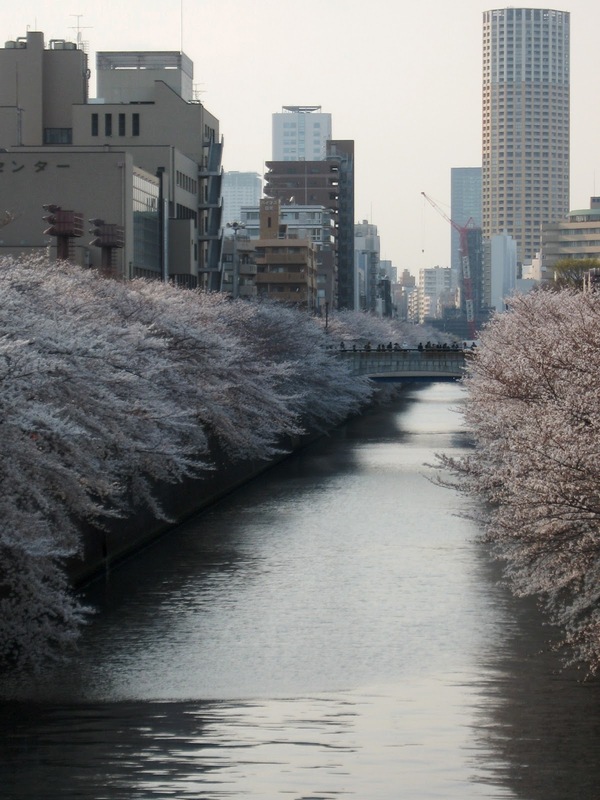 Have any of my readers been to Japan for cherry blossom season? Perhaps some of you live and/or grew up here? I would love to hear about your favourite spot(s)!